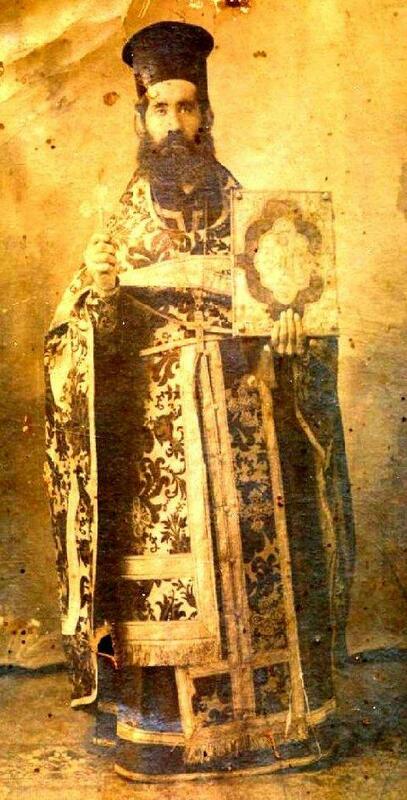 Shortly after his consecration to the sacred episcopacy a century ago – – on March 13th, 1904 — St. Raphael of Brooklyn performed his first priestly ordination, the ordinand being a young widower, Nicola Yanney, a native of the tiny village of Fi’eh in north Lebanon, living with his children on a farm in Gibbon, Nebraska. Father Nicola was ordained [on April 3rd, 1904] for what was then the westernmost parish of St. Raphael’s Diocese, St. George’s Church in Kearney, Nebraska, but he was given pastoral responsibility for an area that is nearly identical to the boundaries of our newly created Diocese of Mid-America. Father Nicola’s parish stretched from the Canadian border in the north, to the Mexican border in the south, and from the Mississippi River in the east, to the Rocky Mountains in the west. It is Fr. Nicola who, as a circuit riding priest headquartered in Kearney, followed the example of his Father-in-Christ, St. Raphael, and visited Orthodox Christians in the scattered towns, villages and isolated farm lands throughout America’s Heartland. From this, we can already see Fr. Nicola’s life and work are significant to us today. He was our first priest and a progenitor of Orthodoxy in the Heartland. In his life he continued the missionary work of St. Raphael. And if we follow his life and work to the end, we see that he is important to us because of the witness he bore to Christ Jesus in the remarkable circumstances of his repose, as well. Certainly, in these things is the lasting legacy of Fr. Nicola to us in Christ’s Holy Church. The future priest, Nicola, was born the son of Elias Yanney in Fi’eh al-Koura, north Lebanon, on February 5th, 1873. Although there is little certain record of his youth and family life there, we do know that he married Martha George al-Baik of Qilhat, the nearest village to the ancient Balamand Monastery of Our Lady in north Lebanon, on November 8th, 1892, at the age of nineteen. Soon after, Martha and Nicola immigrated from Ottoman Syria to Omaha, Nebraska. The next three years, by the grace of God, were happy and prosperous ones for the Yanney family. But, as the well-known Funeral Idiomelon of St. John of Damascus asks, “What earthly sweetness remaineth unmixed with grief?” The stability of the early life of Nicola Yanney was capsized when, on February 11th, 1902 Martha died in bearing her second daughter, Catherine. Catherine herself died nine days later, compounding the sorrow. Through the kindness and compassion of a neighboring “American” farmer, Martha and Catherine were (and are) buried in a single, unmarked grave in the farmer’s own small, family cemetery outside Gibbon. Nicola mourned his loss for eighteen months until, in late 1903 — at the invitation of St. Raphael and with the encouragement of the faithful of Kearney, who had just incorporated a church community under the patronage of St. George the Great Martyr — he made a journey to New York to receive training in preparation for ordination to the holy priesthood. He studied for a mere six weeks or soand during that time became a naturalized citizen of the United States of America on February 9th, 1904. On March 13th, 1904 — the mid-Lenten Sunday of the Adoration of the Precious Cross — Archimandrite St. Raphael was consecrated as an auxiliary bishop to St. Tikhon, head of the North American Archdiocese of the Russian Orthodox Church, and given the title, “Bishop of Brooklyn” and head of the Syro-Arabian Mission. Shortly thereafter, Nicola was tonsured a Taper-bearer and Reader (March 17th, 1904), ordained a Subdeacon (March 20th, 1904), Deacon (April 2nd, 1904), and Priest, on Palm Sunday, April 3rd, 1904 — all at the hand of the newly elevated Bishop, St. Raphael. Upon returning to Nebraska in 1904, the Yanney household relocated from the vicinity of Gibbon, Nebraska to a home in Kearney, where Fr. Nicola could be close to the center of his parish, the church of St. George. The church building was in Kearney, in a one room schoolhouse purchased from the Kearney Cotton Mill. The building still stands, having been long ago converted to a private residence. As of this writing, it may still be seen on the northeast corner of 11th and H Streets in Kearney. While the structure of the church building was small, the boundaries of the parish itself were vast, encompassing all of the Great Plains of North and South Dakota, Nebraska, Kansas, as well as the “southwestern states,” as they were then known, of Oklahoma and Texas. Additionally, Fr. Nicola, during the years of his priesthood until his death, would answer the call of communities of Syrian Orthodox Christians as far away as Michigan, Illinois and Kentucky. Here is a partial list of Fr. Nicola’s pastoral service during the first years of his priesthood, 1904-1905. Listed are just the baptisms performed by Fr. Nicola during that time. Other sacraments and services of the church were celebrated by him on his journeys and duly recorded in his “metric books,” or “Registry of Sacraments.” The data here are taken from those books. Among his first duties in 1904, however, was to serve the funeral of his first daughter Anna, who died that year at the age of eight. Years later, Fr. Nicola would again extend the ministry of the Holy Church to his own family when he celebrated the wedding of his son, Elias (E.K.) to Mary Abraham of Ironwood, Michigan. In the year of our Lord, 1918, the world was stricken with an epidemic of influenza, commonly called “the Spanish Flu,” which, it is estimated affected half a billion people across the globe, taking twenty million lives. Most of the dead in this worldwide catastrophe died not from the influenza itself, but from the pneumonia that would often follow the flu virus in the weakened lungs of the afflicted. Kearney, Nebraska was not spared this suffering. In the optimistic days of the early twentieth century, the city fathers in Kearney, like many other Nebraskan communities, chose not to abide by the quarantine enacted by state authorities. This was perhaps not unreasonable, since in early autumn of 1918 the city had seen relatively few cases of the Flu and even fewer subsequent deaths. But with citizens freely associating at schools, public places and churches, the Flu would strike in a second, much deadlier wave in mid-October. At that time the city was officially quarantined and school classes, church services and other gatherings were outlawed for the sake of public health. It seems that Fr. Nicola and the faithful of St. George observed this quarantine obediently, and for a few Sundays, as the sickness spread through the town, they all refrained from gathering together for the Liturgy as was their custom. Instead, Fr. Nicola himself “brought the Liturgy” to the homes of the faithful who were suffering and there continued his unflagging service of ministering the Holy Things to Christ’s flock. In this faithful service, Fr. Nicola contracted the Spanish Influenza and after one week of suffering, departed this life on October 29th, 1918. May his memory be eternal! We bless the memory of Father Nicola and his brothers in the sacred priesthood who came after him to minister to Christ’s flock in Mid-America, and we bless the memory of their wives and children and of all the sons and daughters of the Church who first brought Holy Orthodoxy to the Great Plains and witnessed to its Truth by their very lives. God grant that we be found worthy of their sacrifice. To which words we can add only one: Amen. while we’re on the subject of Nebraska- I’d love to see a post on the Greek riots in Omaha in the early 1900’s. I’ve read about it from secular sources, but I’d be interseted to see if there were any Church writings on the riots.